A powerful, but disturbing film about the real life Ponzi scheme and the lives it destroyed. Very intense, this movie chronicles the success and failure of Bernie Madoff. It tells the story of him getting caught and what happened to his family. DeNiro plays the infamous man who destroyed so many lives, and he plays the character well, making him completely unsympathetic. Here’s a guy who thinks he did no wrong, and at one point even tries to blame his victims. His wife, Ruth (also brilliantly played by Michelle Pfeiffer,) is perfectly willing to go along with all this and believe whatever her husband tells her. It’s the sons that are the ones who see the truth. Bernie confesses to them what he has done and the sons turn him in. And that’s just how the movie starts. It spirals into something gripping and also haunting after that. The movie has some minor flaws, like not explaining the Ponzi scheme enough, but for what it does pull off, making all of these characters seem real, it is pretty great. 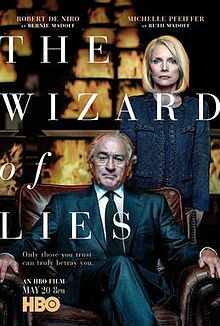 The Wizard of Lies is a smart and powerful movie about the real life man and situation that affected millions of lives. And it all came at the hands of one man. Bernie Madoff. This is his story. It’s the story of his getting away with a Ponzi scheme and then not getting away with it. It’s the story of him telling his family and seeing how they handle it. And it’s the story of how it affected them and destroyed them. Directed by Barry Levinson (one of the great directors, who worked with DeNiro before on Sleepers and Wag The Dog,) this is pretty intense material, but it is also incredibly upsetting. The movie starts with Madoff telling his family. It actually starts right before that with Madoff in his office taking a meeting where he announces that he will be cutting bonus checks two months early. His son, Andrew, and others in the room, question the decision. That’s when Madoff tells Andrew he needs to meet with his family right now. He drives home with both his sons and sits down for a family meeting with his wife, Ruth (played brilliantly by Michelle Pfeiffer.) That’s when he tells them in blunt terms the truth about what has been going on. It has all been a fake. Everything. His whole business. Every transaction he told clients he was making. Every return he showed them. All he was doing was taking money from one client and moving it around to another. The actual workings of the Ponzi scheme are never explained any deeper than that, and this is one of the few mistakes of the movie. 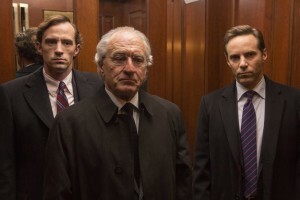 It might have been cool to get a little montage in there showing us how it all worked, meaning that if Madoff was living the life of a billionaire, riding off the money of these people who were giving it to him to invest, then how was he able to move the money around to other people? Wasn’t he spending it himself? Exactly how that worked out, or how it ended up catching up to him, is never really explained. What we do see is that the FBI and SCC are breathing down his neck, and Bernie knows that he’s caught. That’s when he takes the family meeting. He wants to cut the checks two months early to make sure that everyone is taken care of. He expects to have one more week out and about before the FBI comes for him, during which time he will move money around so that his kids and family are provided for and nobody ever has to worry about money again. Only the kids turn him in. This happens the very same day that he tells them. The two sons go and meet with lawyers and the lawyers advise them that if they don’t turn him in, then they are accessories to the crime. And so they do, and that’s the end for Bernie being out of handcuffs. Ruth asks the sons to come downtown to sign for Bernie to be released on bail and they refuse. That ends up being the last time the sons talk to Ruth for years. At this point, the movie starts flashing back. We go to a calmer, happier, and yet more exciting and fun time when the money was rolling in. We see Bernie in his luxurious life and right away notice that he was a jerk, even then. He gets mad at the staff of a restaurant for having a dirty plate and smashes it on the floor. Then he goes to a party and grabs the asses of two women. He does it in a playful manner, thinking he could be the funny old man who can get away with this, and when Ruth sees it, she also makes jokes about it, completely in denial about what is really happening, saying something like, “somebody is going to need the dog house tonight,” and laughing it off. We see the guy who is Bernie’s right hand man, Frank Dipascali, (played by Hank Azaria,) telling a vulgar story / analogy, and going on with it for quite a long time. I’m all for good, sexual humor, but with this guy it is creepo material as can be seen by all the jackass guys around him listening to this and laughing. Notice there are no women anywhere around the conversation. We see Dipascali being interviewed after Bernie is caught and saying that he was in on everything and knew exactly what Bernie was doing the whole time. Of course he did, he was Bernie’s number one guy. The sons and wife, on the other hand, were completely kept in the dark, to the point where they weren’t even allowed to set foot on the floor where all of this fraud was going down. That floor, known as the seventeenth floor, was where everything happened. Apparently it was even hidden to the point where the only access to it was from the stairwell. This is kind of like a Being John Malkovich, eleven and a half floor, hidden floor kind of situation. And based on the movie, the ways the FBI finds out about it is when Dipascali comes downstairs to watch the FBI raiding another floor. He leaves and goes back up and one of the agents asks Bernie’s brother who that guy was. Bernie’s brother responds, “he’s just some guy who works on the seventeenth floor.” At that point, the agent responds, “there’s a seventeenth floor?” And within moments, the FBI is standing outside the door in the stairwell, ready to bust in. Some of the most fascinating moments involve really understanding the people who were effected. As far as Bernie goes, we get a number of clips of him being interviewed throughout the movie, and not only does he not express any real remorse, but he tries to blame his victims. At one point he says, with a straight face, that they should have been looking more closely at what he was doing, and that they didn’t want to know the truth. He thinks they should take some responsibility for what happened too. His sons have got it pretty bad as well. The whole world thinks they were in on it and knew the truth the whole time. They say, “these two kids worked for their father and worked alongside him. They had to know.” Only they didn’t, and the accusations really hurt, to the point where one of the sons takes his own life. The movie shows all of this. It doesn’t hold back, and really digs deep. There are two areas where it could have been improved, but in all other areas, it was pretty perfect. Those spots are that we could have seen more about how Bernie knew he was caught, and what led to him being caught, (we learn of a man who was onto him, because his stocks always went up, but the SCC didn’t believe this man and turned him away.) And we could have also seen more about how the Ponzi scheme operated. But the movie wasn’t so much about what he was doing, as it was about the aftermath of his being caught. What we did get to see, before the FBI got him, was the way Bernie operated, getting people to invest with him, holding out and refusing to work with them, until they offered him loads of money to invest. This guy was a con man, and Robert DeNiro really captured that well. Both he and Pfeiffer knock it out of the book in what is a pretty gripping and emotionally heart-wrenching film.